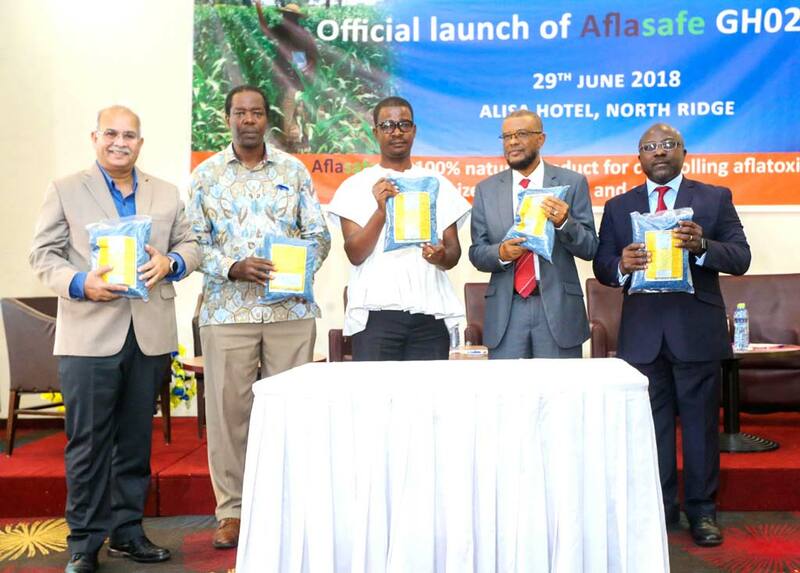 Aflatoxin is a major threat to health, food security, and trade but positive change was heralded in Accra recently, at the official launch of Aflasafe GH02. Aflasafe offers a powerful solution to the aflatoxin threat which is amplified when combined with other good practices and with up to 100% aflatoxin reduction in more than half of the tests, Ghana sets a brand-new Aflasafe record. 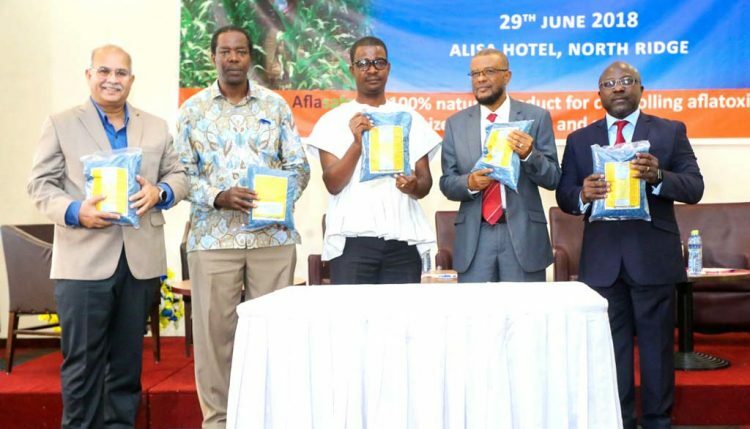 Research Leader of the Africa-wide Aflasafe Initiative at IITA, Ranajit Bandyopadhyay (left),with Abdou Konlambigue of ATTC (rightmost) and other dignitaries showing off packs of Aflasafe GH02 at its launch in Accra. Besides celebrating the advent and outstanding performance of Aflasafe in Ghana, participants at the launch came to grips with aflatoxin, deliberating on the need for greater awareness, incentives for farmers, and the potential for Aflasafe to transform access to markets. The all-natural Aflasafe GH02 is tailored specifically for Ghana and was developed by IITA in collaboration with the United States Department of Agriculture – Agricultural Research Service (USDA ARS), and Kwame Nkrumah University of Science and Technology (KNUST). The local Ghanaian farmers also made a vital contribution testing Aflasafe on their farms. With the registration of Aflasafe GH02, Ghana is now the latest of six nations where Aflasafe is on sale. Aflasafe GH02 is distributed in Ghana by our new partner, Macrofertil Ghana Limited, a company established in Ghana by Louis Dreyfus Company to take over its agriculture input business in the country. Louis Dreyfus Company Group is a world leader in agroprocessing and in marketing agro-commodities and agricultural inputs, so it brings proven expertise in reaching farmers. In his keynote address, Professor Richard Tuyee Awuah of KNUST spoke on the challenges of aflatoxin contamination in Ghana, and the parts we can all play in tackling them. This was followed by a lively panel discussion on the event’s theme— Aflatoxin control: Whose responsibility? Read Aflasafe media release for details.